February 1, 2018 welcomed a ‘changing of the guard’ for one of our longest reigning service businesses. 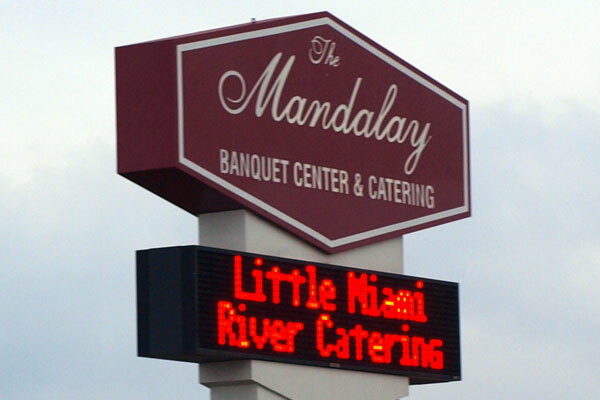 Don Phillips, creator and owner of the Mandalay Banquet Center at 2700 East River Road sold his beloved business to Molly and Matt McConnell who own Little Miami River Catering (LMR). Don and his wife Cay plan to stay to provide assistance where needed throughout the transition. LMR is longstanding established full service catering company with additional locations in both Xenia and Bellbrook. During the ribbon cutting it was shared that the Mandalay will now be the corporate offices to LMR, creating even more possibilities for the hosting side of the business. The grand celebration was highly attended and provided a delectable array of food showcasing both the capabilities and possibilities of this joint new venture. Don and Matt both shared that the transition has been going smoothly and that the retention of the existing employees at Mandalay was a top priority throughout the process. The new energy of this acquisition presents an exciting time for both Mandalay and LMR. To learn more about their services and/or to book an event, you can call (937) 848-2464 or visit http://www.lmrcatering.com/ Please join us in welcoming Molly and Matt to Moraine.